PDF documents containing a general introduction to timer bars as well as an overview of Gnosis timer configuration commands and options can be found within the Gnosis addon folder. Please visit Gnosis @ curse.com for detailed information about Gnosis. 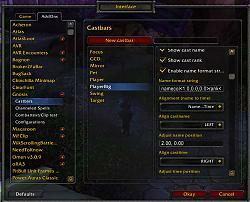 changed command "cast : all" to "cast : any"
IMPORTANT: exit your WOW client before updating. do not downgrade, otherwise you will lose your character specific settings. 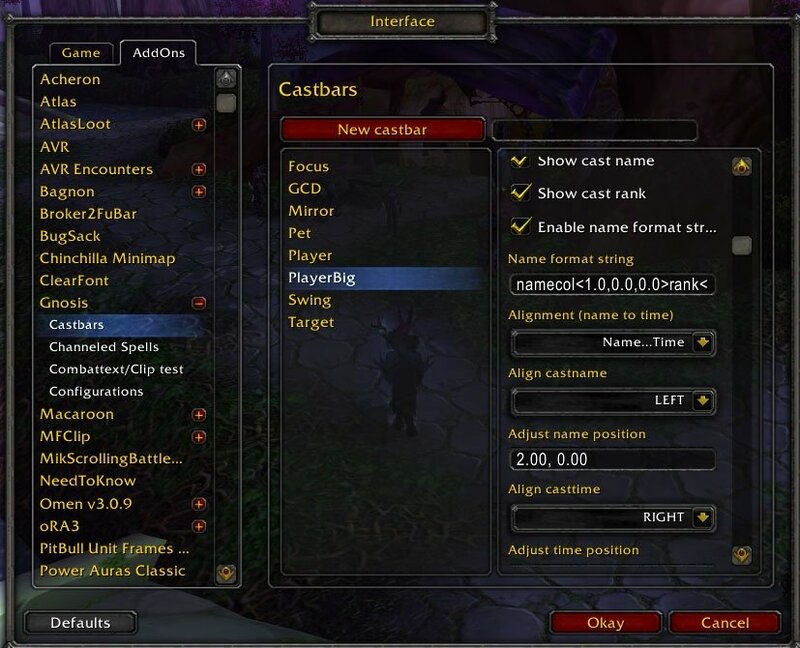 changed how bars display text/icon when "shown when not casting"
added function Gnosis:LoadConfig(name,bMainTab,bCastbars,bChanneledSpells,bClipTest) to allow for easier loading of configurations; might be useful for addon compilation authors or if you would like to be able to load configurations with macos; example: /script Gnosis:LoadConfig("DefaultConfig",false,true,false,false) to just load castbars from configuration "DefaultConfig"
no new feature releaes coming in the near future! only bugfixes and adding of localizations. Initial wowinterface release, for more changelog information please visit curse. Fingers crossed for an update. does paypal switch my currency over to your currency electronically? or do i need to do something special? Thank you for your intention to donate. I really appreciate it. Every currency should work fine, so just donate whichever amount in whatever currency you like. Hey, my Gnosis options are in German. Doesn't Gnosis pull from the client my language? Yes it does, but you can also set the desired locale manually (which you probably did unintentionally). Is it possible to make the spell icon a higher strata than the cast bar so I can center the icon over my cast bar? is possible to show a castbar only at a specific class or specific char? No but you coud do that with WeakAuras. What is the proper frame to anchor to keep the castbars where the Blizzard ones would be (i.e. underneath the target buff frame)? I have been trying with no success. To be clear, I want the target and focus castbars to stay in their Blizzard locations, automatically adjusting to the number of buffs. Last edited by Tonyleila : 09-13-13 at 01:03 PM. Thank you for providing a donation. It is highly appreciated and will help me continue supporting Gnosis. Press the button below to begin the donation process.